This website features information and links for a variety of mobile applications that I developed and produced in the areas of arts and crafts, education, games, music, and more that are available on iTunes™ and Google Play™. 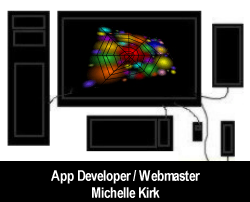 I develop mobile applications from concept to completion that include multiple device support and am a developer and producer of websites, setup domain name registration, email, and other IT services including Windows server configuration. In the summer of 2014, I developed and produced my first educational music guitar app called Color Tab. I graduated with distinction in the Spring of 2015 from CSUN with a Master's degree in Computers And Educational Technology. ©2002-2019 Michelle Kirk All rights reserved. No part of this website may be reproduced in any manner without permission from webmaster.